1. Fold four 24x12 inch pieces of aluminum foil, heavy duty preferably, in half crosswise. Open and place on a work surface. 2. Divide zucchini and summer squash evenly between the pieces of foil and arrange on layers on one half of each piece of foil. Divide equally and add the onions and sliced basil to it. 3. Drizzle each packet with 1 tablespoon of wine and ½ tablespoon olive oil. Season with salt and pepper. 4. 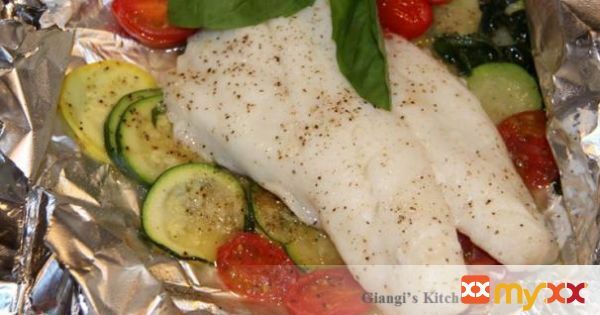 Place the orange roughy fillets in top of each portion of vegetables and season with salt and pepper and the remainder of the olive oil over each fillet. 5. Fold and crimp edges of foil to seal packages. 6. Build the heat on the grill to a medium heat. Place packets on the grill grate. Close the cover and cook for about 10 minutes. 7. Open carefully the packets as steam will escape and garnish with fresh basil leaves.